This frozen yogurt is so much easier than homemade ice cream! Just so you know, this freezes a lot quicker than ice cream. Also, if you want tart frozen yogurt, feel free to decrease the sugar! Stir the yogurt, sugar, and vanilla extract together until the sugar has dissolved. Cover. Refrigerate 1 hour. Pour the chilled mixture into an ice cream maker and freeze according to manufacturer’s directions until it reaches "soft-serve" consistency. Transfer to a one- or two-quart plastic container with a lid; cover surface with plastic wrap and seal. 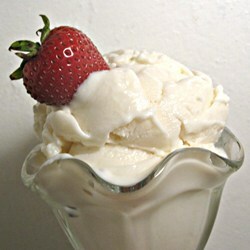 For best results, frozen yogurt should ripen in the freezer for at least 2 hours or overnight.